Nature conservation work - providing a haven for wildlife and popular educational resource for local school children - has been recognised with The Wildlife Trusts’ Biodiversity Benchmark being awarded to EDF Energy for a second year. Following a surveillance audit, the company received the re-certification in recognition of its environmental management of the power station site. Hinkley Point B’s nature trail comprises a mosaic of habitats including flower-rich grassland, scrub, woodland and ponds and is designated as a Local Wildlife Site. The Biodiversity Benchmark Award enables organisations across the UK to assess the standard of their conservation management, improve their environmental management procedures and demonstrate their commitment to enhancing the nature in support of the UK Biodiversity Action Plan (UK BAP). It is composed of a set of detailed requirements which an organisation must be able to meet. Hinkley Point is one of four EDF Energy sites to be awarded the Biodiversity Benchmark, with only six energy sites across the UK being accredited to date. There is a diverse breeding bird community including bullfinch, linnet, reed bunting and song thrush, all of which are listed for priority action under the UK Biodiversity Action Plan, as well as whitethroat, lesser whitethroat, sedge warbler and chiff chaff. In summer pyramidal orchids, yellow rattle, bird’s-foot-trefoil, fleabane and ox-eye daisy provide colour to the grassland habitats which are a haven to butterflies like small copper, meadow brown and brown argus. 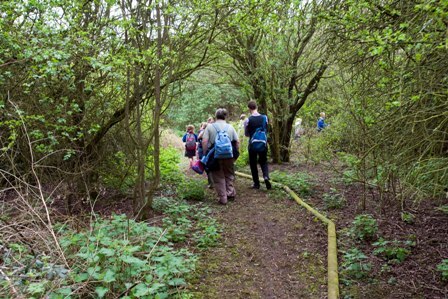 A nature trail enables staff and guided groups to enjoy the special wildlife of the site. To arrange a group visit please email hinkleybtours@edf-energy.com or call 01278 654699. The Wildlife Trusts: There are 47 Wildlife Trusts across the UK working together for an environment rich in wildlife for everyone. With more than 800,000 members we are the largest voluntary organisation committed to all of the UK’s wildlife whether in the countryside, towns and cities or at sea.